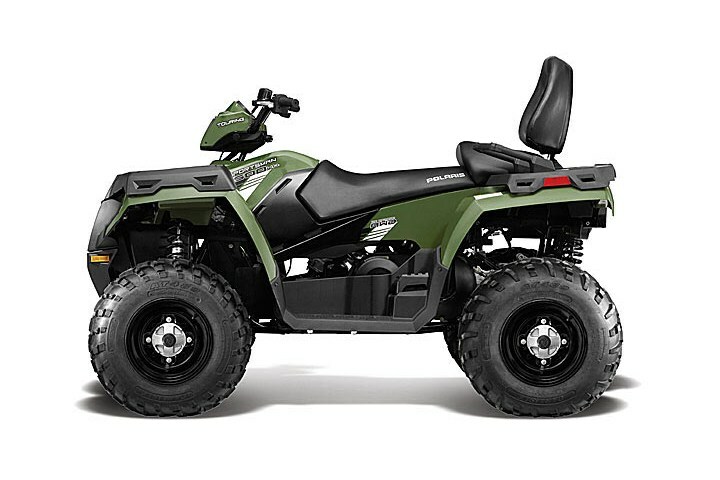 2013 Polaris SPORTSMAN® TOURING 500 H.O. We took our Sportsman 500 H.O and gave it a longer wheelbase and a plush passenger seat to create a value-packed, 2-up touring machine. Works to monitor and control downhill braking to give you optimum control and smooth, even deceleration during descents (less than 15 mph). A new, more aggressive body style gives the Sportsman an intimidating look and clear sight lines for the driver. Integrated front storage and Lock & Ride compatible rear rack make it easy to carry gear. Radiator is mounted 3" higher in the chassis an angled rearward to keep it out of mud and you on the trail longer. The ultra-comfortable seat and backrest are fully padded and contoured for full support, with a slightly raised position so you can see down the trail. Starting with 8.75" of suspension travel, our proven Rolled IRS is angled rearward to keep the ride smooth for you and your passenger and reduce squat while accelerating.